This Garden Party diaper cake is so inspiring! It is quite attractive to look at, Rachel's use of colors is perfect, and the stark white diapers are a striking contrast. It is definitely a different diaper cake and in all the right ways. Love it! For every diaper cake that a reader submits to this website, thousands of readers are inspired for years to come. Our readers submit their diaper cake and baby shower ideas for others to see and get creative ideas. This is what makes this website so great - all of our thoughtful readers. Thanks for your unique and beautiful diaper cake, Rachel!! My younger sister was ordered on bed rest this past June at 25 weeks. When planning her shower, we decided on a Garden Party theme, in the hopes of bringing some of the outside in. While this cake may not fit within the traditional mold, it was a lovely addition to the garden party decor. -This is my second cake and this time, instead of bottles, I used the cardboard center from a roll of tin foil. It was the perfect height for a 3-tiered, Size 2 diaper cake and gave me a better base for the topper. -Instead of traditional rubber bands, I use small clear hair ties. I prefer to spend the extra dollar to know that the rubberbands will not be visible, no matter what type of ribbon/trim I decide to use. 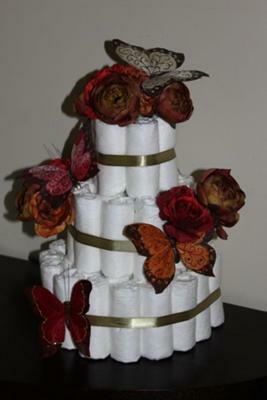 This diaper cake looks amazing with garnishing --thanks for having an awesome post like this! Hahahah really very interesting and inspiring cake. Diaper cakes are becoming very popular among people having babies. Mostly this trend is increasing in western world or Europe countries. These cakes look beautiful but totally different from other cultures. I think they are great for decoration pieces. I used Pampers Swaddlers and rolled them from the waist to the fold. This is beautiful. What brand of diapers did you use? It's so hard to find any without any characters and colors on them. My daughter lives in another state, and sadly I won't be able to attend the shower next week. My sister in law and I decided to send her a 'shower in a box' so we could be with her in this way at least. I wanted to include some type of dessert, and your 'cake' caught my eye immediately. After almost giving up I saw your design. Wow...stunning to say the least. Thank you. My daughter will love it.